During Wednesday’s American Workforce Policy Advisory Board in Washington, D.C., Apple CEO Tim Cook revealed some 50 percent of the tech giant’s U.S. hires lacked a formal four-year college degree. The statistic was divulged as part of Cook’s introductory remarks, which were aired live on CNBC. Cook, who sat next to President Donald Trump at the meeting, opened the gathering with a brief synopsis of Apple’s views on education. Cook did not elaborate on whether the 50 percent figure encompasses both corporate and retail sector hires, but it can be assumed U.S. Apple Store staff are included in the number. Apple owns and operates more than 270 first-party outlets across the country, with employees ranging from sales specialists to managers and Genius Bar staff. The Apple chief went on to tout the company’s educational initiative, saying he believes computer coding skills will be a highly desired asset for future job seekers. In particular, Apple and other tech companies will see an increasing need for talented coders in the coming years, Cook said. That refrain has been heard many times before, mostly from Cook, as Apple jockeys for a slice of the education market. Cook went on to detail Apple’s own coding curriculum, Everyone Can Code, which is offered to schools across the U.S. The program has been accepted by 4,000 schools and 80 community colleges, Cook said. Apple’s push into the classroom leans heavily on its proprietary Swift coding language, used to develop apps and software for iOS, macOS, watchOS and tvOS. Students are offered specialized learning tools like Swift Playgrounds, as well as dedicated hardware like iPad, Apple Pencil and Apple TV. 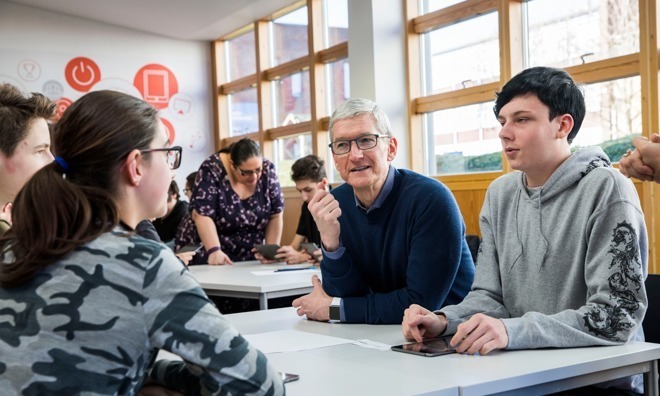 While Apple’s previous educational efforts revolved around Mac, the company over the past few years has concentrated on an iPad-based curriculum, rolling out tools like class management apps Classroom, Schoolwork and the ClassKit API.